Sitting down to create a content calendar often feels daunting, even for those of us who work in the industry. However, armed with a few helpful tips and tricks, it can be simple and easy. With that in mind, I’ve outlined my favorite methods for brainstorming good blog topics. Look at what your competition is writing about. Go through all your competition’s content channels: blogs, social media, videos, apps, email marketing, press releases, guest blogging and more. Look for trends in what they’re writing about, but also look for holes, or places where content is missing. Let this serve as inspiration for your content. Look at their most shared content using BuzzSumo. Their free version will work for this! Look at what keywords they’re using and what they are ranking for using Raven. Use Google to see which of their pages rank highest. Just search “site: [sitename.com]” and note the results. Use Moz or Raven to see who is linking to your site, then look at what they are writing about. Use social and content monitoring tools like Right Relevance to see what content is being shared around and who is talking about it. By getting a feel for what you’re competing against, you’ll better be able to create a content strategy that outranks your competition. Look at what’s driving traffic to your site. If you don’t have Google Analytics set up on your site, stop reading this and do it now. You can use it for free, and it’s impossible to market your site well without it. When looking at these metrics, I try to think of blog topics that are similar to the most popular posts, that expand on them or that provide updates. I also look at what search terms are bringing in traffic, and look for more ways to use those keywords in my blog posts. By having an idea of what content is working and what isn’t, it’s easier to come up with new content ideas. Look at what people are searching for. Look at Google’s autofill suggestions. 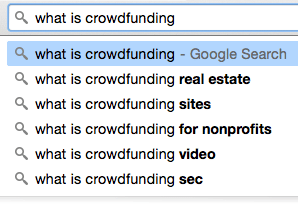 For example, when I type “What is crowdfunding,” I get the following suggestions. Based off these autofill suggestions, there may be value in me blogging about the different crowdfunding sites and platforms, tips for a crowdfunding video, or the SEC’s position on crowdfunding. These topics would all be relevant to Enventys Partners’ target audience, and would also respond to frequently-searched queries. Look at what people are asking on Quora. Quora is a platform where anyone can ask questions for experts or those with first-hand knowledge. Perform a simple search for Quora questions in your industry, and I’m sure you’ll find plenty of inspiration for what to blog about. Put yourself in your target audience’s shoes. This method may seem a bit old-fashioned, but being able to empathize with your target market is a critical part of a successful marketing strategy. Think about what questions your target market would ask. For me, this may mean asking myself what first-time crowdfunders would be searching for. Take on your brand persona, then imagine yourself looking for valuable information you need to know.